View from the Birdhouse: Remember Liddle Kiddles? During my childhood I loved little dolls: Liddle Kiddles, Storykins, Rockflowers, Dawn and Friends, Flatsy dolls, and more. I also loved dollhouses! 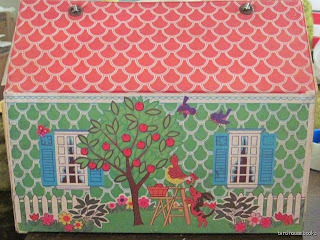 It was so much fun to find this 1966 Mattel Cape Cod dollhouse last weekend -- the perfect scale for Liddle Kiddles. I was tempted to keep it, but I'm in a big "Project Declutter" here, so I put it on eBay: Liddle Kiddles dollhouse. 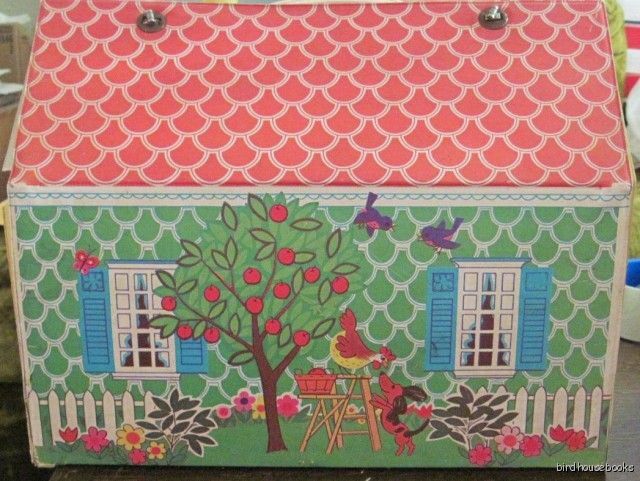 Love the style of colorful graphics on this vinyl dollhouse. Be sure to look for the little Dachshund dogs on front and back of house!